Cumbria. The Lakes District. Everyone talks about it. And for good reason, I’ve discovered, The Lakes District is truly one of the most majestic places to visit in England. No matter where you visit, you’ll be rewarded with stunning views; be it one of the great lakes, daunting pikes, plunging hillsides, lush forests, rolling green hills or cosy fireplaces at one of many delightful B&Bs. I stayed at a small B&B in the village of Bootle, in South-Western Cumbria. Mike and Joan live in The Old Rectory of the village. After their children left the nest, they’ve used the large amount of space in their home to provide one of the most lovely B&B experiences I’ve ever had. I arrived to a bright smile, a warming Agar stove, a luscious bed and two gorgeous puppies. Mike and Joan are retired and now work full-time on maintaining their small farm. They (and their B&B) are fully self-sufficient when it comes to food – growing all of their own vegetables, fruit, pigs, chooks, ducks, turkeys and geese (including their eggs). As such, breakfast the following day comprised a selection of goose, turkey, duck or chicken eggs, bacon or sausage (from organic pigs they’d raised), any kind of vegetable I desired, fresh strawberries and raspberries, a vast array of homemade jams, chutneys and relishes and homemade bread! I have to say, the Cumbrian sausage and bacon with homemade green-tomato relish really hit the spot! Guests were also welcome to join the evening meal. A visit to the Lakes certainly wouldn’t be fitting without a walk to really take advantage of the stunning landscape it has to offer. I managed to fit in 3 beautiful hikes! The Bootle Lookout is a lovely walk from the Old Rectory (about 90min round trip) taking you through the village, by a little waterfall, and up a lofty hill to give you a view of the Cumbrian coastline and the Irish Sea. The walk up Irton Pike, while not well trodden and unfavourable in bad weather, delivers magnificent views of Wast Water, (almost) Scafell Pike, Great Gable the Cumbrian Coastline. On a clear day you can see the Isle of Man and Scotland in the distance too! It decided to rain when I got to the top! Scafell Pike, however, was my big achievement for this visit! I’d never heard of it before Mike and Joan mentioned it’s amazing views and challenging walk. As it happens, Scafell pike was just around the corner from Bootle, waiting to be conquered by yours truly. Clouds covering the Scafell Pike Peak. At only 12 weeks post-spine surgery I took my time and rested several times along the way. On paper, the journey seems straight forward – 5 miles round trip is the shortest option with other longer options for the more adventurous. But don’t let this small distance fool you. The short distance only means that the ascent to the 978m peak is steeper! It took me about 4.5 hours! But the feeling of accomplishment was so worth it! Make sure you have a map and compass, water and decent hiking shoes. If you go in Summer then there are sure to be many others conquering the English Peak too. Cumbrian cows along first section of Scafell Pike walk. Making some friends along the way up, including Dolores the rugged up little whippet attempting the challenge. The first third ascends along a clear path up the side of the green hills before the grass disappears and climbing up cliff and rock faces is necessary. There are several steep, rubble-like sections that require extra care. The ridge along the top is covered in boulders and requires careful concentration, follow the piles of stones that act as ‘buoys’ or ‘markers’ for the route. On a clear day the views from the top are spectacular and some of the best in Cumbria… Unfortunately to summit was covered in clouds the day I went. But the views on the way up and down (before the encompassing clouds) are just as divine. The descent is also steep and I had to take extra care. I found the descent the most challenging section of the walk; the impact and strain on my knees and ankles made me very wary, plus my core strength & stability had been weakened by the surgery 3 months prior. But, as the tortoise will tell you; slow and steady wins the race! Wast Water, welcoming flat at the end of the hike. There are no shortage of walks to do in the Lakes District; whether you’re in the south-west like me, closer to Ullswater, Windermere or other lakes/regions, the scenery will not disappoint! 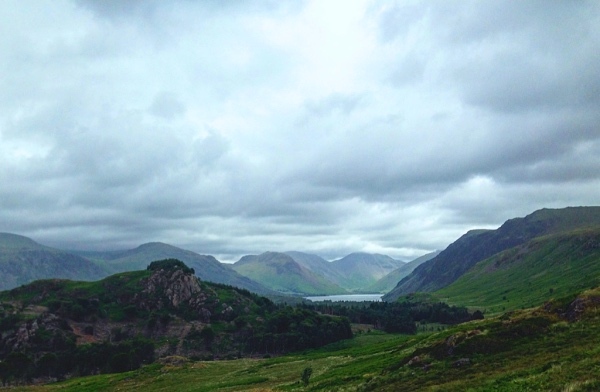 Public transport to (and around) Cumbria is not great, I hired a car and recommend that having a car is the best way to get around easily, particularly if you want freedom throughout your stay. Otherwise a visit with a tour group may be an option for you. If you hire a car, make sure you get a Sat-Nav as the mobile data is pretty much non-existent. Windermere is about a 3 hour drive from Manchester. Don’t rely on mobile service for communication (especially mobile data) while in Cumbria. Most homes/pubs/hotels have wifi if you feel the need to connect. If you decide to go hiking, make sure you do your research first – get a proper map, go with a compass, water, food, appropriate clothing and footwear. I didn’t have a map when I did Scafell Pike and would have become terribly lost if it weren’t for several others also hiking on that day. Look ahead at the weather and make smart decisions about whether or not to modify/change your walk if the weather is unfavourable. There are plenty of gorgeous hotels, B&Bs, and pubs in Cumbria, just take your pick!